1. Sometimes the best web sites are the simplest ones. 2. Sometimes you have to re-invent an already successful web site if you truly want to take it to the next level. Hotornot was the ultimate bootstrapped success story. The two founders, James Hong and Jim Young, grew the Hotornot brand into a cash-generating machine without ever accepting any outside funding. The site basically started out as a joke, inviting users to upload their photos so that other people could give them a vote from 1 to 10, based on how "hot" they were. The site became immensely popular, spawning many copycat sites that just never quite caught on. As with most businesses (especially online), the companies that penetrated the market first built up the most loyalty and brand awareness and became the most successful. The founders of Hotornot wisely assumed that many of the visitors to the site would also be interested in possibly finding a date, so the site eventually extended into an online dating service. The two founders decided to charge a fee to use the service, and were making literally millions in profits per year when they abruptly changed their plans last year and decided to move back to a free, advertisement supported model. However, spammers soon took over, and they quickly made the decision to abandon the free model and switch to a tiered system. The changes must have worked, as they ended up selling the company for a reported $20 million dollars. This is after the duo pulled a reported $20 million dollars in profits out of the company over the 7+ years that they ran it. So all told, the duo banked $40 million from a site that basically started out as a joke. Not bad at all. Avid Life Media is apparently planning on building up the brand and hiring more people to work at the company, so it will be interesting to see the direction the site now takes. 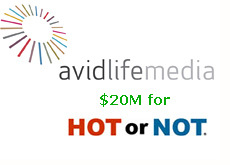 Considering how much cash the site spins off per year, this investment is certainly not a bad idea and I wouldn't be surprised at all to see Avid Life Media selling off this property for millions more down the road.